Habit: Perennial herb to shrub, generally resinous. Stem: 2--25 dm, leafy. Leaf: generally sessile or short-petioled. Inflorescence: heads radiate, disciform, or discoid; involucres cylindric or obconic to bell-shaped; phyllaries graduated in 5--9 series, linear to (ob)lanceolate, tips erect or generally recurved; receptacle flat, pitted, epaleate. Ray Or Pistillate Flower: 0 or 5--18; corolla yellow or sometimes becoming red-purple, ray generally 2--9 mm (<= 1.8 mm in Hazardia cana). Disk Flower: 4--60; corolla 4--11 mm, gradually flared from middle, yellow, tinged red, or sometimes becoming red-purple. Fruit: 1--10 mm, 4--5-angled; pappus of 20--60 barbed bristles, 2.5--12 mm, white to red-brown. Habit: Shrub 6--25 dm, +- densely woolly-tomentose. Leaf: 4--14 cm, (ob)ovate, thick, obtuse, +- serrate. 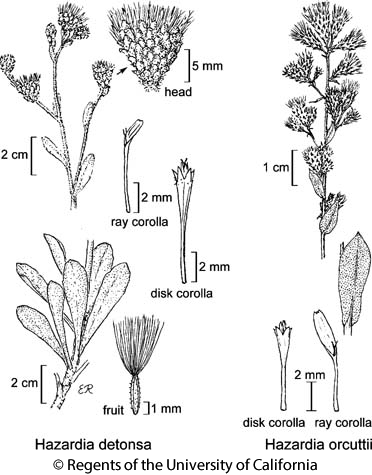 Inflorescence: heads radiate or disciform; involucre 10--13 mm wide, +- bell-shaped; phyllaries 30--50, 4--10 mm, oblong, acute, +- densely tomentose. Ray Or Pistillate Flower: 6--14; corolla sometimes becoming red-purple, tube 5--6 mm, ray < 2.2 mm, not exceeding disk corolla. Disk Flower: 30--40; corolla 8--10 mm, sometimes becoming red-purple. Fruit: 3--4 mm, 4-ribbed, hairy; pappus 6--9 mm, (+- red) brown. Chromosomes: 2n=10. Ecology: Open rocky slopes, sea cliffs, coastal scrub, chaparral, pine woodland; Elevation: < 450 m. Bioregional Distribution: n ChI. Flowering Time: Apr--Nov Note: Highly variable; hybridizes with Hazardia squarrosa var. grindelioides. Citation for this treatment: David J. Keil, Gregory K. Brown & W.D. Clark 2012, Hazardia detonsa, in Jepson Flora Project (eds.) Jepson eFlora, http://ucjeps.berkeley.edu/eflora/eflora_display.php?tid=3184, accessed on April 22, 2019.
n ChI. Markers link to CCH specimen records. Yellow markers indicate records that may provide evidence for eFlora range revision or may have georeferencing or identification issues. Purple markers indicate specimens collected from a garden, greenhouse, or other non-wild location.